How Ekiti state 4.7 billion naira bailout fund was shared – Royal Times of Nigeria. 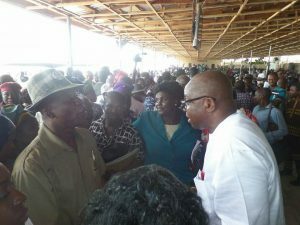 Ekiti state governor, Ayodele Fayose on Thursday met with labour leaders, teachers, civil servants and some other stakeholders at the government house to brainstorm on how the 4.7billion naira bailout fund will be spent. At the end of the deliberation; N1.8billion went to the Local Government, while N2.9billion was allocated to the State Government (Teachers and others). The governor enjoins the union leaders to submit areas of priority on which the money must be spent.